Loving this dress!! I have a fun reunion event coming up and needed the perfect cocktail dress for an evening dinner. Not too flashy, not boring, not too young, not old! 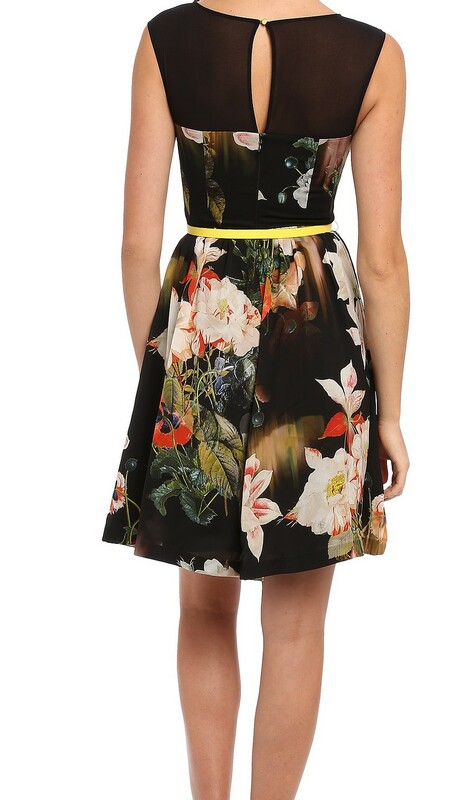 After countless shops and dresses I found the perfect frock at Ted Baker. The main body fabric is silky smooth and feels luxurious and the sheer panel at the neck and back adds lady like polish. The fit is amazing (I don’t even need a bra), and it’s super comfortable – a big plus. I’m ditching the yellow belt for evening and will probably wear some sparkle on my wrists. Super excited I found this dress! 20 Oct	This entry was published on October 20, 2014 at 7:59 am. It’s filed under Style and tagged Floral Cocktail Dress, Ted Baker Cameela Floral Dress, What to wear to a cocktail party. Bookmark the permalink. Follow any comments here with the RSS feed for this post.